THE NOISE OF cars beeping outside the Coombe maternity hospital was at times deafening this morning. Nurses marched on the picket line as their third day of strike action got underway. The public’s support for them – if you base on that on beeping cars – is still as high as ever. We spoke to some of those striking for better pay and conditions today. Watch the video above for our full report. Additional reporting by Daragh Brophy. Email “Nurses on strike: 'You can't go home after your shift and feel you've done a good job'”. 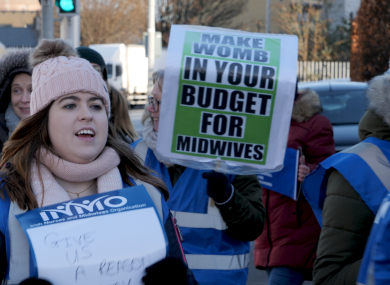 Feedback on “Nurses on strike: 'You can't go home after your shift and feel you've done a good job'”.